The 2018 hurricane season is predicted to be even worse than 2017. It seems like every year people wait until the storm warnings begin to think about getting prepared. Don’t find yourself standing in long lines for the bare basics to survive hurricane season. Get your family ready now. First of all, lets get some of the myths associated with hurricanes out of the way, shall we? Myth #1: Tape Your Windows Before A Hurricane. Nope. When high winds hit an untaped window, the pieces of glass shatter into a zillion pieces. However, when high winds hit a taped window, the pieces of glass break into big pieces that could really do damage to you. The zillion little pieces might take longer to clean up, but at least you’ll still be able to clean them up. Myth #2: Crack Open Your Windows To Stabilize Pressure. Buildings aren’t airtight. They aren’t going to explode during a hurricane. But, opening a window will allow violent wind into your home. And when that wind gets in, it’s going to look for a violent way out. Myth #3: I Only Need To Board Up The Windows Facing The Water Since when do hurricane winds only blow in one direction? Plus, boarding up your windows protects things from the outside flying through your windows into you home. BTW, if you do plan to board up your windows, have them pre-cut and ready to go. PRO TIP: *this post contains affiliate links Each window you board up will require 4 windstorm window clips. Get them before the storm season starts. Myth #4: Leaning Against A Door Or Window Being Blown In By Wind Pressure Will Save It From Breaking. Blink. For the love of Pete, if it looks like a window or door is bending due to fierce winds, get the hell away from it. Myth #5: Hurricanes Only Strike The Coasts. I’m Too Far Inland. Famous Last words. 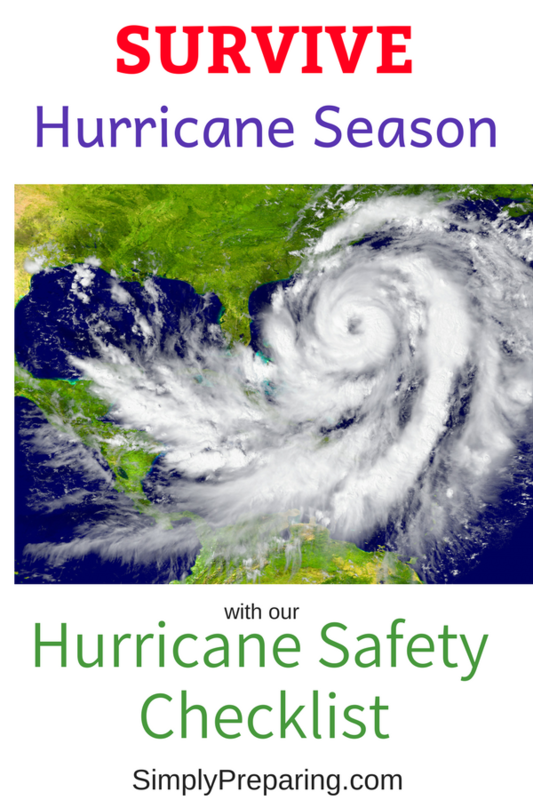 It’s important to be stay informed during hurricane season, and be aware of potential storms. You are going to need to know when to evacuate and have a plan in place of where to go. Learn Community Evacuation routes and how to quickly get to higher ground. Decide on which room in your home will be your ‘safe room’ to wait out the storm if things get dicey. Store your hurricane emergency there too. The American Red Cross has a Hurricane app that allows you to monitor conditions in your area, find help, and let others know you are okay. The first step in your Hurricane Emergency Kit is for each family member needs to have a 72 Hour Kit that is ready to go in case you need to evacuate. Bonus points if your 72 hour kits include sleeping bags too. Our post on Simple 72 Hour Kits will walk you through this. Because of potential flooding contaminating the local water supply, it is important to have enough water on hand to get you through 2 weeks. That comes out to be 14 gallons of water per person. And that is only enough for drinking. Furthermore, flooding brings Dangers of Standing Flood Water, that those of you in Hurricane country need to be aware of. Did you know you can get about 30 gallons of water from your hot water heater? We show you how in our How to Get Emergency Water From Water Heaters post. Pro Tip: *this post contains affiliate links A good item to have on hand in this category is a Water Bob. Simply unfold the Water Bob into your bathtub and fill it with 100 gallons of clean water from the faucet. Without enough water you are not going to survive hurricane season. Pro Tip: With a hurricane comes the need to know how to survive a Boil Notice. Two weeks of food for each person in your family. Stock up on items that can simply be heated up, or items that only require hot water to create a complete meal. The odds of the power going out during and after a hurricane are high. Having a safe way to cook indoors, even if it is just heating stuff up, is important to be able to survive hurricane season. I really like these GAS ONE Butane Stoves. Please, stock up on fuel too. Flashlights for every family member. Camping lanterns to light up common family areas. Stock a good first aid kit and know how to use it. I’m sorta partial to the Midland NOAA Emergency Weather Radio. It has a solar panel, hand crank, and a rechargeable lithium battery too. Another good option is the Kaito. Cell phones can be true life savers during disasters, as long as they are charged, and cell towers are still up. A portable charging station is a necessity. It’s also a good idea to have a land line during a disaster. It’s summer. It’s humid. There’s no power and nerves are fried. Having a battery operated fan for each family member will make life much more survivable. I know these are expensive. I also know that during extended emergencies they save lives. If there is anyway you can manage it, get your self a generator. If you already have a generator make sure it’s in working order. 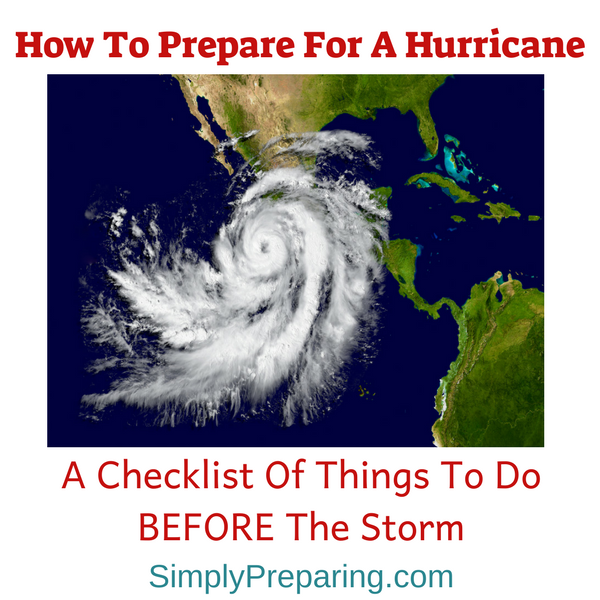 PRO TIP: Want to learn more about how to survive hurricane season? Ready.gov has got some great information to help increase your preparedness. Have you ever experienced a hurricane? What were your most needed preps? What did you wish you had? A boil notice is issued when a municipal water provider detects dangerous pathogens and microorganisms in the water that can make us sick. Other reasons for a boil notice include lead in the water, water main breaks, power outages and flooding. Your need to be able to survive a boil notice often comes in the aftermath of hurricanes, like in Puerto Rico. Surviving a boil notice takes preparation. First, you’ll need to know exactly what you can and can’t do with your tap water. Some boil notices will state that tap water is not to be used for drinking, ice cubes or cooking, but can still be used to do laundry in. But, you know the s has really htf when the water restrictions say the water can’t be used in any form or fashion. This is what Puerto Rico has been dealing with for almost a year now. BTW, we are less than 3 months away from the start of the next hurricane season. Are you prepared? Take a minute and think of all the ways your family uses water in a 24 hour period. That is going to be the amount of water you would need to boil to keep up the status quo. Yikes! According to the CDC, to make water safe to drink, you should fill a large pot with water and bring it to an actual boil for at least one minute; and then allow the water to cool and place in a clean container. If you can’t boil water, you can disinfect it by using 1/8 teaspoon of NON-scented bleach per one gallon of water. Mix it well and wait at least 30 minutes before drinking it. Make sure your containers are clean by sanitizing them with bleach as well. Rinse containers thoroughly before storing water. When my family lived in Turkey, we often had to rely on using non-scented bleach to disinfect our water. No doubt about it, this water is going to have a funky taste. Consider having powdered Kool-Aid or something to help cover that taste. You will also need to use BOILED or disinfected water in your coffee pot. Even though that coffee pot heats the water up, it doesn’t boil it safe. Pro Tip: When trying to survive a boil water notice, water filters will NOT be enough to purify your tap water. You’ll need to either rely on stored water, boil the water, or disinfect it with bleach. Let’s face it. Trying to boil the amount of water you typically go through on a daily basis will be impossible. You will need to be prepared with items to help cut down on the amount of water you’ll need. 1. Stock up on no-rinse bathing wipes. These wipes clean well with just a bit of water, but you don’t need to rinse afterwards. We use these often when my son is in the hospital. Even if the boil alert says it’s okay to bathe in your tap water, I wouldn’t suggest it if you have any open wounds, or are immuno-compromised. 2. Have a can or two of dry shampoo on hand. 3. Stock disposable plates, napkins, and utensils. 4. Fill empty bottles of laundry detergent with water and mark them as ‘cleaning water’ and store them with your other water supplies. 5. Have hand sanitizer available. 6. Cleaning wipes will come in handy! PRO TIP: Use tape to wrap around facets and handles to disable them. Put BIG signs reminding people NOT to use tap water. People are so used to using water from the tap, that it is simply second nature to reach for the faucet. Do you know how to figure out how much water per family member to store? Our post on Calculating Drinking Water has done the math for you! Next, you’ll want to know how to fill soda bottles and larger containers with safe drinking water for storage. We’ll walk you through it in our Emergency Drinking Water and Storage post. 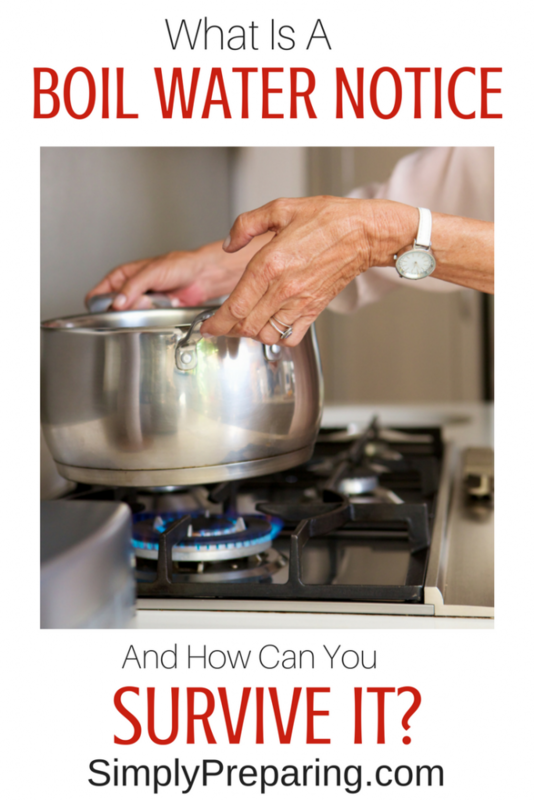 Think A Boil Notice Can’t Happen To You? Emergency water boil notices are issued hundreds of times a week all though out the country. Sometimes they only last a day or two. Often they last longer. For Preppers water storage must be a priority in order for your family to survive a boil notice. Has your family ever lived someplace where the tap water was not safe to drink? How did you provide clean drinking water for your family?